For a long time I hesitated whether to publish this recipe. For some Dutch people this dish raises memories to a traumatic period in thier lives. The tulip bulb soup was served during the Amsterdam Symposium to Food in January 2015, which had the theme ‘Food, hunger and conflict’; I also presented a short talk to introduce the soup. But I have to confess that the caterer had not prepared the soup according to the recipe. He had treated the tulip bulbs as if they were onions and chopped them, but it is imperative that they are grated for this soup. It may seem an insignificant difference, but the resulting soup will not be thickened. 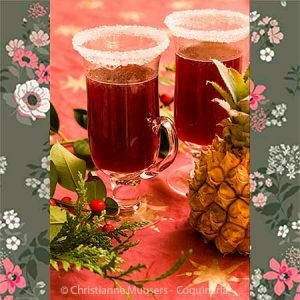 But because I still receive requests for the recipe, I have decided to publish it on Coquinaria. When using this recipe, please credit the source. Bulbs of tulips and other spring flowers were already used as surrogates before the Hunger Winter. The picture on the left dates from 1941 and was published in De Haagsche Post. In that year there was already a shortage of coffee beans. The alternative was the ‘regeerings-koffiesurrogaat’ (governmental coffee substitute), which consisted of 52% barley or rye, 20% chicory, 12% coffee, 8% green peas and 8% tulip bulbs. Are tulip bulbs the same as onions? To the eye, tulip bulbs and onions look very much the same. The germ of the new plant is surrounded by several fleshy or scale leaves. But the composition of tulip bulbs is very different. They are rich in carbohydrates, onions are not and contain more water. That is why tulip bulbs (and sugar beets) were promoted by food agencies in the Winter of ’44/’45 as surrogate for potatoes. It is even possible to make tulip bulb flour. Pesticides were not used on such a large scale as today. When buying tulip bulbs for preparing this soup, it is absolutely necessary to ask the supplier whether the bulbs can be eaten. Even so-called organically grown bulbs may not be suitable for consumption. When reading the horror stories in nineteenth-century publications on fraudulent practices in food production, one may be put off of food altogether. For example, in Amsterdam milk was diluted with dirty water from the canals because the milk would turn a yellow colour, suggesting a higher content of fat. On the other hand, practices that are commonplace today were condemned, such as using bean meal and other additions to improve bread, or pumping water into meat (sometimes more than 10 % of the weight). The food industry was already experimenting with the use of surrogates before the Second World War. Just think of margarine, a butter surrogate that was invented just before the French-Prussic war of (1870-1871). But during the war it became a necessity to replace original ingredients with surrogates. Not just coffee, tea and cocoa, but also spices, bread, sweeteners, dairy products and even other products like soap were altered by adding alternative ingredients or using artificial ones. This could be the start of the rise of using food additives. Of course it is understandable that large-scale food production needs other ingredients and techniques than small-scale production or home-made dishes. But I do wonder whether all food additives that are mentioned on labels are really necessary for industrial production. For example: some brands of pesto (an Italian condiment made from basil and pine nuts) contain potatoes as thickener and cashew nuts as cheap replacement for pine nuts. But nobody adds potatoes and cashews when making pesto at home. Before the war, this would have been considered fraudulent. But the food industry had discovered the economic advantage of using substitutes, and consumers had become used to them. So much so, that many people do not even know how a really good meat stock should taste. Stock should not taste salty at all, but rather have a slightly sweet flavour, even without adding salt or sugar. By the way, I personally consider meat and peat products that have been inflated with water fraudulent. The tulip bulb soup uses boiling water, and that needs fuel. But fuel was also scarce during that very severe Winter. Everything that could burn was used, including cupboards and books. By using a haybox one needed less fuel, but still the food had to be brought to a boil first. 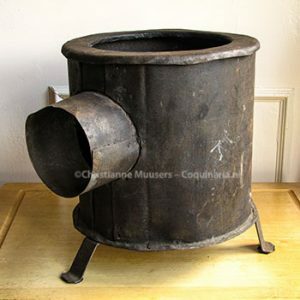 People used very small stoves for this, like the one in the picture. This one measures only 20 cm or 7½” accross, and was less than 30 cm or 12″ in height. This is a detail from the folder issued by the Food Agency in The Hague, published in January 1945. The Food Agency in Amsterdam published the same text. The tulip bulb soup is the first recipe in the folder. The other recipes are for porridge, mashed tulip bulbs, vegetables with tulip bulbs, fried and roasted bulbs, and savoury and sweet tulip bulb cookies. The folder ends with two methods for making flour from tulip bulbs and directions for keeping them. Fresh bulbs could be kept until the beginning of February. To keep them for a longer period of time, they need to be dried, but the germ has to be removed first. The Dutch Resistance Museum in Amsterdam has folder with another recipe for tulip bulb soup in its possession. That recipe also hammers on the importance of removing the germ before preparing the bulbs. The bulbs are then boiled until done, drained and mashed, and the soup is finished by adding vegetables, salt and (surrogate) spices. Tulip bulbs can be used for food. They have a high content of carbohydrates. Depending on which variety, they have a slight tang. They are more or less mealy, which is why it is not possible to provide the weight of the exact amount of bulbs for some recipes. Peel the tulip bulbs, cut them in half and remove the yellow germ and hard, bad parts. 1 litre water, 1 onion, four or five tulip bulbs, aroma, salt, 1 teaspoon oil, surrogate curry powder. 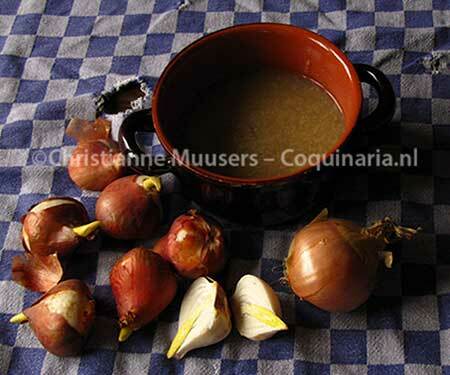 Chop the small onion and fry with the oil and the surrogate curry to a light brown. Add water and aroma. Bring the soup to the boil. Grate the cleaned tulip bulbs above the boiling liquid. Cook a little longer while stirring and finish with some salt. Tulip bulbs are rich in carbohydrates, but they will not thicken a soup in the same way as flour does. The pulp of the bulbs will remain discernible as small flakes. The ‘surrogate curry powder’ consisted mostly of a filling material with some food colour and volatile essential oils for flavour. I used simple curry powder for my adaptation because – luckily – surrogate curry is not available anymore. However, that means that the soup will have a better flavour than the original version. Warning – When planning to prepare this soup, make absolutely sure that the bulbs are suitable for consumption, because bulbs are treated with all kinds of pesticides. That is not a problem when using them in the garden, but it is when they are meant to be eaten. Buying ‘organically grown’ bulbs is not enough, ask the supplier for information. For 4 persons; preparation in advance 15 minutes; preparation 10 minutes. Peel the tulip bulbs. Cut them in half and remove the germ. Then grate the bulbs on a fine-meshed grater. Do this just before adding them to the pan, as the pulp discolours quickly. Heat the oil in a small pan. Fry onion and curry powder until the onion has coloured slightly. Add water and aroma. Bring to the boil, stir in the grated tulip bulbs and boil for another few minutes. Add salt to taste. Warm, in a bowl or soup plate. 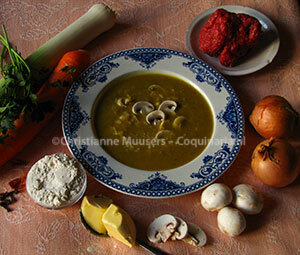 I could not resist temptation, and adapted the picture of the soup. Click on the picture to see the original colour version. The bulbs on the left are tulips, the one on the right is an onion. Was the tulip bulb soup meant to be a first course? If so, the rest of the meal was not much more filling. One portion of this soup (1 cup or 2½ dl) contains about 71 kcal. Between December 1944 and April 1945 the energy of the daily food rations dropped from 1000 kcal per person daily – which was already too low – to less than 500 kcal daily. I have calculated the nutritional value of a curry soup from a Dutch cookbook from 1930, the AVRO-kookboek from P.J. Kers (see picture) for comparison. That soup contains 250 kcal for a portion of 1 cup (2½ dl), and it was a first course in a meal containing meat, vegetables and potatoes, and a dessert. Even a portion Cup-a-soup (1¾ dl or ⅔ cup) would provide more energy than the tulip bulb soup: 81 kcal per portion. In 1886, the Swiss Julius Maggi developed a soy sauce-like herbal seasoning based on the meal of beans and wheat, to compete with the meat extract of Liebifg. 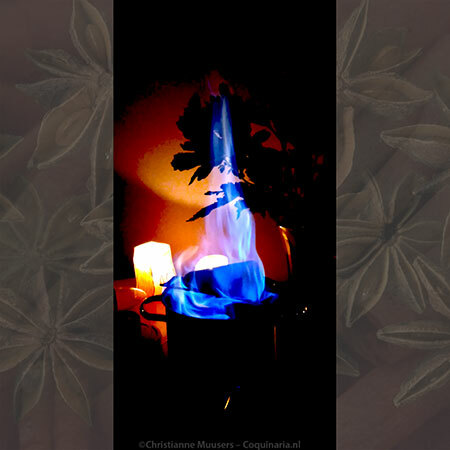 The taste is much like that of lovage (Levisticum officinale). In Dutch lovage is now even called maggikruid (Maggi herb). But lovage is not present among the ingredients of the seasoning. I am not going to repeat the history of Maggi, just visit the German wikipedia the subjects Maggi and Maggi-Würze. In this article in the Chicago-Tribune, author Kevin Pang mentions that Maggi seasoning exists in many varieties for specific regions. Het gebruik van tulpenbollen. 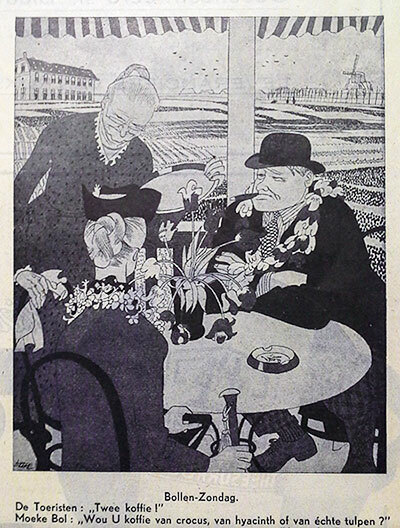 (‘The use of tulip bulbs’) Voorlichtingsbureau van den voedingsraad, ‘s-Gravenhage, januari 1945. P.J. Kers, Het A.V.R.O. kookboek. Deel 1 (‘The AVRO cookbook’, vol.1, 1930). P.G. Kuyk and K. Schots, Het boek der voedings- en genotsmiddelen en der surrogaten in oorlogstijd. (‘The book on nutritients, stimulants and surrogates during the war’). Algemeen publiciteitskantoor, 1942. L.H. Lumey, A.D. Stein, K.M. van der Pal-de Bruin, E.W. de Man, De Hongerwinter familie studie. Onderzoek naar omstandigheden rond geboorte en gezondheid op latere leeftijd. (‘The Hunger Winter family research. Research on the circumstances around birth and health at a later age.’ TNO, Leiden, 2006. This soup full of surrogates could be called a ‘mock curry soup’. 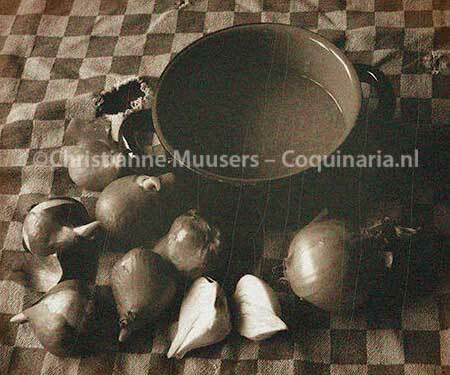 Not a culinaryy delight, but an iconic recipe for the Netherlands during the last winter of the Second World War.